TransPulse is and always will be focused primarily on preventing suicide in the trans community. That being said, there is much more to trans life than time spent in crisis, and knowing what resources are available goes a long way to keeping people from reaching the point of considering suicide. In addition to the vast community available in the forums and our chat server on Discord, there are plenty of tools and directories available on the TransPulse site aimed at helping members in all stages of their transition. To start your training, we'll touch briefly on each of these pages so you can familiarize yourself with what's available. All TransPulse volunteers should be familiar with the resources the site has to offer. When directing members to a particular item from this list, be sure to include the link to the appropriate page. In the forum, you can click the link icon to make part or all of your sentence a link to the page you're referencing. In chat, be sure to enclose the link in the < > characters to prevent the enormous page preview from taking over chat. By far the most useful - and most used - function of the TransPulse website, the resource locator is a database of thousands of providers who work with the trans community. As shown above, many different types of practitioners are included. 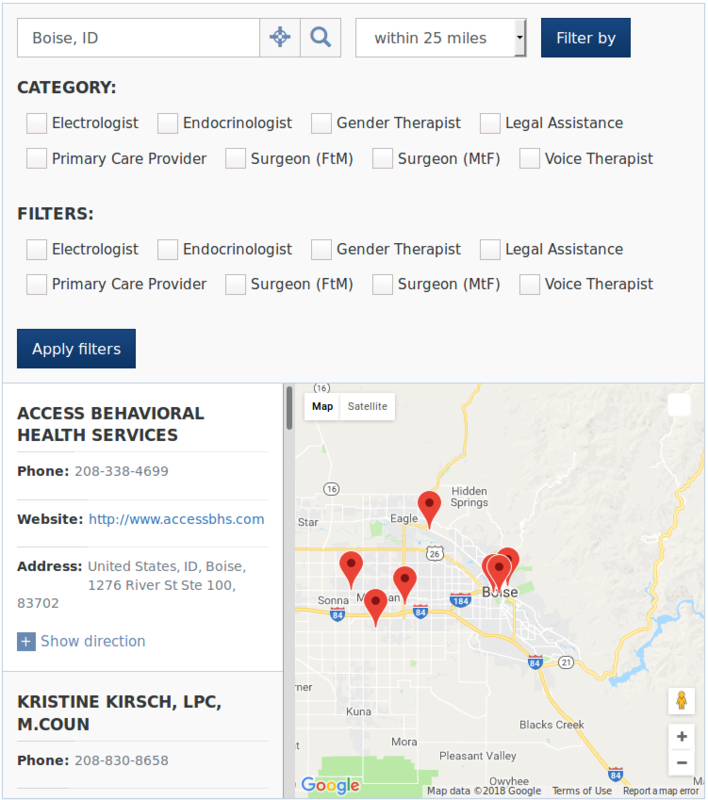 Searchable by city name or ZIP/post code, the database will display a customizable list of providers within a range of up to 100 miles from the chosen search location. Any time it's appropriate to suggest that a member see a professional the database contains, we should always include a link to this page. Note that while the database includes providers all over the world, some areas are more populated than others. The UK is very light, for instance, because most trans care is handled through the NHS, requiring a referral from a general practitioner. Other countries may be sparse due to a language barrier. This page is a relatively recent addition to our arsenal. It contains details on the dangerous things trans people might be tempted to do in the name of aligning themselves with their true gender, such as black market or herbal hormones, mimicking physical symptoms, and more. All moderators should be familiar with the things on this list and be ready to address the practices in a factual, non-judgmental way if and when they come up in conversation. This page is a collection of links to other sites we've found useful over the years. All moderators should review it at least once every couple of months to make sure you're familiar with what's here. There's no telling when it might be appropriate to give a member a link to one or more of the sites gathered here. Often, our members feel alone where they live. This page aims to show them there are other trans people locally and give them an opportunity to get involved in their own back yards. Note, though, that we depend on the facilitators of these groups to keep us updated with any changes, so it's entirely possible groups listed have changed times or locations. They may even be defunct and we wouldn't know. When providing this link to a member, we should always caution them to reach out to the point of contact before planning to attend a meeting. There are a handful of scholarship-like programs in the US that award funding for transition-related surgeries on a yearly basis. This page contains information on what's offered, who's eligible, and how to apply to each program. We aren't aware of any similar programs outside the US, though we do look from time to time. Similar to the list of support groups, this is a list of local businesses of all types that welcome trans customers. It includes restaurants and hotels, retail, florists. . . you name it, it's in here. Also like the list of support groups, the information on this page is likely outdated, so members are encouraged to contact the businesses before making plans to visit. For those who are in the market for a new job, this list will be right up their alley. The employers on this page all offer at least one health insurance package that covers part or all of transition-related medical care. The colleges shown here offer transition-related care as part of their student health plans. This list is broken into two groups; one that offers coverage for hormone therapy only, and another that includes surgery as part of the care provided. As with all other resources, members considering attending one of these schools should call their student welfare office to confirm that treatment is still covered. These pages offer guidance on how to size clothes meant for your true gender and provide a list of places that welcome trans customers. While the size conversion charts mainly address the MtF crowd, shoe sizes are covered going both ways. If someone wants to get in touch, this is where they'll go to do it. The site's email address isn't published anywhere public to ward off the spam bots. Emails sent via this form generally get a response within a few hours, though it may take longer depending on the nature of the request. I don't expect anyone to suggest to members that they contribute financially. Most of us are in tight spots, and pushing for contributions too often can leave people feeling guilty if they're not able to spare anything. While I will occasionally put out a call for donations when we get hit with a large number of expenses all at once, I include this link here only so you can show people where to give if they ask you about supporting the site. While PayPal is our primary payment processor, I realize some people dislike them. If they object to using PayPal, I can and will work with them on alternate donation methods. I've accepted contributions via money order and signed up for a couple of individual banks' transfer services so far to accommodate those who wanted to give but were hesitant to use PayPal. If this is a concern for someone, please invite them to contact me via the contact page or private message in chat or the forums. Donations are entirely discreet and anonymous. This means two things. First, credit card statements don't say anything about TransPulse - or, for that matter, transgender anything. Statements will show that the money was sent to me personally, using my name. Also, I never disclose the names associated with donations received. I realize many who give may not have changed their names legally to reflect their true gender, and I would never identify someone by a name that brings discomfort or pain.